India is the second largest nation with a population of 1.3 Bn, and agriculture is the backbone of its economy which employs more than 50% of the workforce and contributes about 17% of the nation’s GDP. 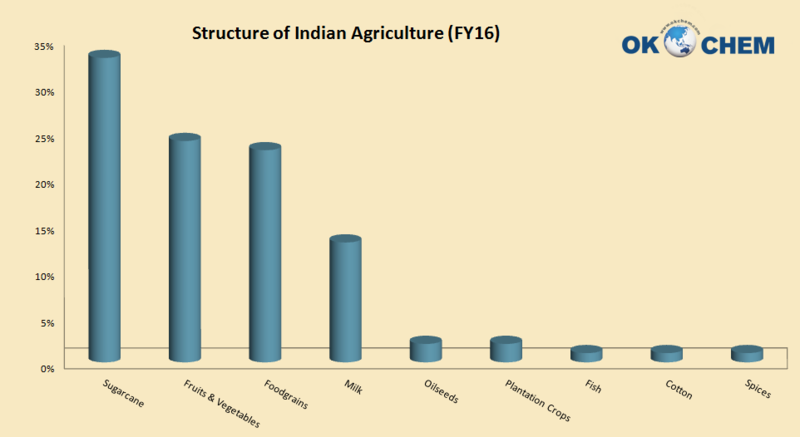 Now, India is a leading exporter of agricultural products, with the total agricultural exports from USD 11.3 Bn in FY10 to USD 33.9 Bn in FY17, and has also become a very important player on the global market, especially for rice, cotton and sugar. Even though India has doubled its yield per hectare in the past decades, it is still facing many challenges like pest attacks which have caused a 25% loss of the global crop output. 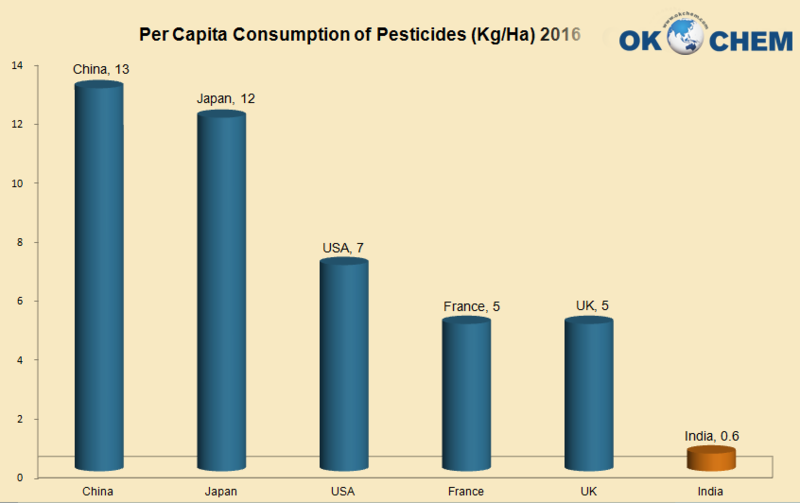 The consumption of pesticides per hectare in India is 0.6kg, much lower compare to that of China, Japan, USA, France and UK. To ensure an increasing crop output and improve the food security of the nation, the better technology & quality seed, fertilizer, irrigation and crop-protection chemicals are becoming an important roles to enhance the crop productivity. 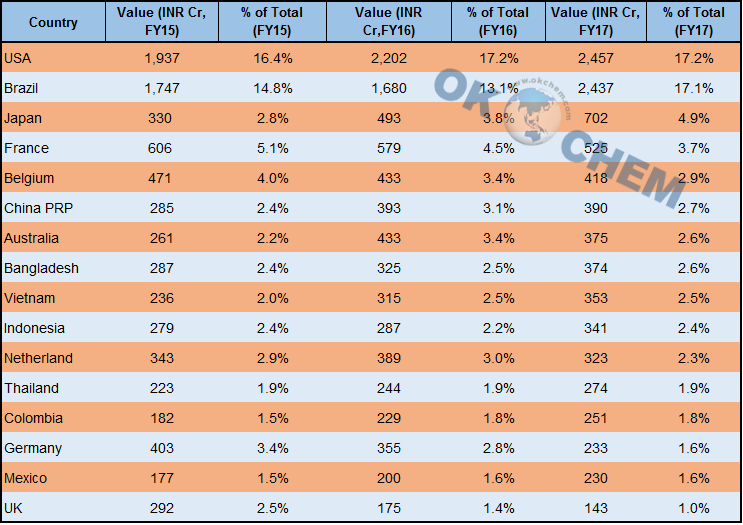 As the fourth largest producer of agrochemicals after USA, Japan and China, the agrochemicals in India is valued at USD 4.1 Bn, and expected to reach USD 8.1 Bn by FY25. Insecticides dominate almost 55% of the domestic crop protection chemicals market with the value about USD 2.3 Bn, also making India become the 13th largest exporter of pesticides globally. In addition to exports to top 8 countries namely USA, Brazil, France, Japan, Australia, Belgium, China and Netherlands which contribute to about 50% of total agrochemical exports, the manufacturers could also explore other countries in South East Asia, Latin America and Africa. Crop protection chemicals & solutions is a fast developing industry globally open to innovation. Though the application of agrochemicals in India is presently at very low level as compared to global norms, the agrochemical sector has huge potential for growth as it plays a vital role in protecting the crops from pests and increasing the farm productivity.